My mom's mom, my Grandma Jean, passed away before I was born. Taking from the scraps of memory and reminiscence and photos and memorabilia I've collected over the years, I know she was a bright, beautiful, sensitive, creative, troubled, clouded, precious soul. In the picture at left, she's bent at her slender waist, graceful in her hospitality, looking every inch the beguiling 1960s social butterfly. Like my mom, I wish we had other pictures of Grandma from this day. Last year, my uncle gifted me an old composition book that belonged to Grandma Jean long before she was a grandmother to anyone, a mother to anyone, a wife to anyone... she was little Jean Piersel, a teenager in saddle shoes, and she filled this little book with clippings about the movie stars of the 1930s and 1940s. Her own observations fleck the pages in girlish, oblivious script. It was a great insight into my grandmother and her youth. If only she knew that I share her adoration of those golden years in Hollywood. If only she knew that I grew up gazing at a picture of her, nigh eighteen, golden hair sloping in perfect forties style and resting gently on her delicate, alabaster collar bones, and that I thought she was possibly the most beautiful human I'd ever seen. And recently, my mom came across the following two short poems written by Grandma in 1964. I have such fun along the way. Examine each flower that grows by the lane. Just talking to kittens and making dogs bark. I'll smell cookies baking and feel mother's embrace. How do I know Spring is coming? How do I know Winter's gone? And listened to its song. How do I know Winter's over? How do I know Spring is due? A positive sign that it's true! Now we see Kristen Campagna whose favorite past-time is horses and more horses. Kris seems most at home in a pair of breeches and her Pendleton wool hooded adaptation of the Mexican Poncho. Fresh simplicity with just a touch of youthful high fashion gives these pre-teens a feeling of growing up. The poncho is a McCall's pattern and was made by her mother, Mrs. Peter Campagna. Now, I have no idea what a "dimity" is, but I'm pretty sure I never wore one. It's a word that finds itself out of place in our slick, mini-skirted, spaghetti-strapped era. 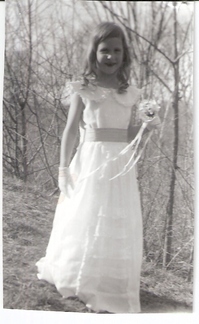 I was pretty rough-and-tumble as a child, but it occurs to me that I wouldn't have minded a fashion show. And had I been fortunate enough to meet my Grandma Jean, I'm certain she would have enjoyed fitting me for my own personal dimity. In one of the last photos taken of my grandma before she was claimed by cancer, she is sitting on a park bench wearing a visor with an opaque greenish bill. The sunlight playing through the plastic casts an odd glow over her forehead and the bridge of her nose. But she's nibbling a chocolate popsicle and her eyes are alight with mischief. It's my favorite kind of candid... proof that, even at an odd moment, a loved one is happy. My middle name is hers, and I do think of her every time I write it out. Jean. It's a good, solid name. It's precise, but pretty. It's short, but sweet. It's an excellent way to remember my grandmother. 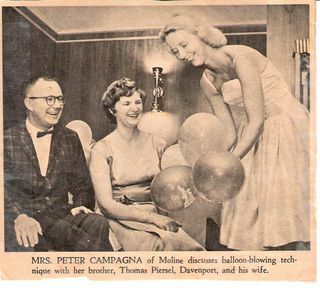 This entry is dedicated to Mrs. Peter Campagna by Mrs. Jonathan Camp.